You are here: Home » Company » Why Solar? Why Solar? Two Important Reasons! The two most important reasons to integrate a solar heating system for your pool are the savings and the environment. A reduction in your utility bill can range from 15% to 50%. Even a 15% "tax-free" savings is pretty good. Making the solar energy decision also reduces the impact of pollution and greenhouse gasses which are detrimental to our health and our environment, as we all know is an ongoing problem. As you have seen, energy costs continue to rise. In the last two years alone, the price of natural gas has more than doubled. 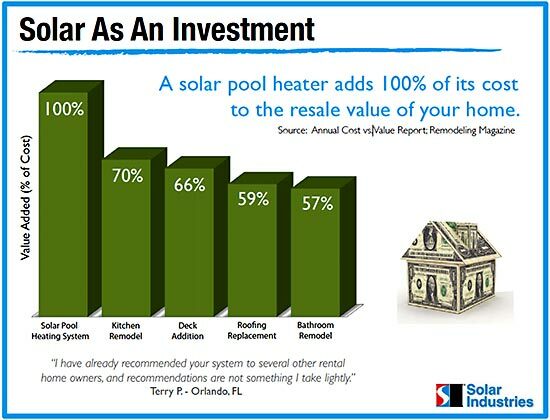 On the other hand, the sun’s energy is free, and more and more pool owners are taking advantage of this opportunity to save money and avoid future price increases. 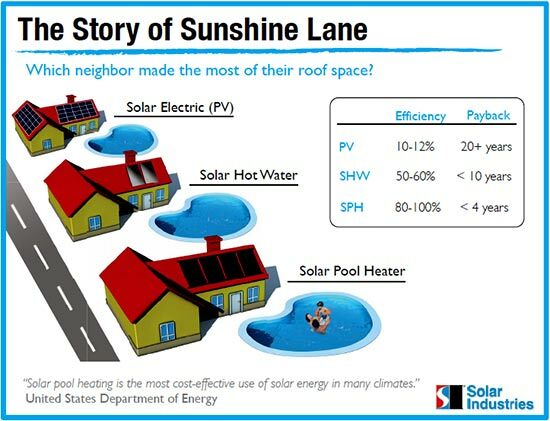 Many pool owners switch to solar because it meets all of their heating needs. But, even if you continue to use a gas or electric heater as a backup, solar heating is a smart investment that will save you money, year after year. A properly sized solar heating system will get you swimming earlier in the spring and later into the fall. Whether or not you have an existing heater, you can keep your pool warmer and open longer with free energy from the sun. A solar pool heating system used in combination with a solar pool cover can significantly extend your swimming season.. 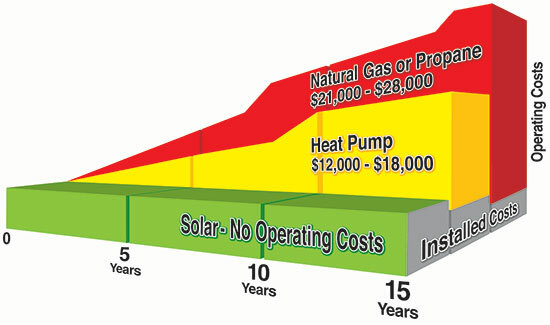 Solar equipment often lasts longer than gas or electric heaters. Solar collectors have a 10-year warranty and generally last 20 years or longer. Unlike gas and electric heaters, which should be serviced by a technician every year, a solar heater requires very little servicing. Again, that means less cost and less hassle for the pool owner. Burning fuels also produces carbon dioxide, the main cause of climate change. Replacing a natural gas or propane heater with a solar heater could stop three to 10 tons of carbon dioxide from entering the atmosphere each swimming season. That’s about the same amount produced by operating your car for one year! Click here to contact us to ask us anything and for a free estimate on solar pool heating!